Firstly, a little news from Berkley UK: for fans of the I Am Number Four series, the promotional campaign for the April 12th release of The Power of Six has begun. Which means, naturally, competitions! I haven't read the novels myself (yet, anyway - my bibliophilia may still grow all consuming! ), but for those who have, Berkley have a new game over at this Facebook page, where fans have a chance to win copies of both this novel and advance copies for the next release in August - as well as some other great prizes. For those who know the series, this could be a nice chance to get your hands on the upcoming books. Secondly, less in the realm of the newsworthy, my personal reread of The Wise Man's Fear. 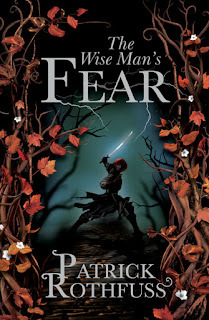 Patrick Rothfuss' second novel, and the sequel to the acclaimed The Name of the Wind, The Wise Man's Fear inspired a few mixed thoughts from me on first readthrough. That, and the fact that Rothfuss writes some of the best prose in modern fantasy, inspired this reread. This isn't a review, but just a few thoughts on what I found! - It's as episodic as I recalled. As opposed to Name of the Wind, which had a single overriding narrative, Wise Man's Fear could just have easily been 'Selected Adventures of Kvothe'. (Or even 'Kvothe Learns a New Skill (Or Two, Or Three, Or Five)' Because - my, does Kvothe garner new abilities fast. 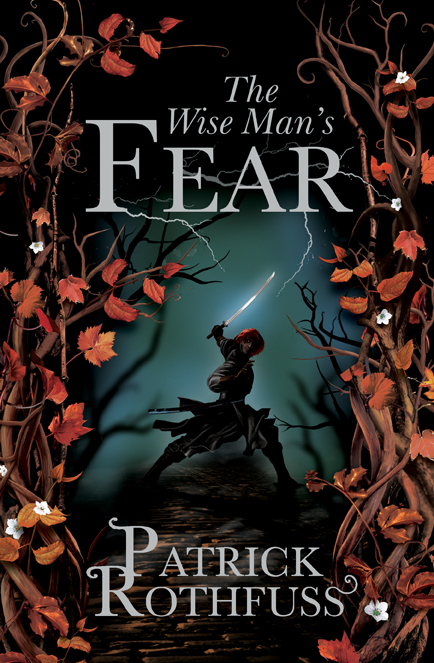 He was rather a genius already, but with Wise Man's Fear, Rothfuss takes this to new levels - which unfortunately negate some of his more interesting problems (the swordfighting being one such - because his existing improvisation in the case of armed conflict was far more interesting). Still, it is mitigated by the fact that Kvothe is explicitly the legendary figure of his time - intentionally larger than life, if you like. - The traipsing after bandits in the woods wasn't nearly as wearing as I recalled. Although that would be pretty hard (my memory being of constant repetition of firemaking and storytelling). In fact, I actually rather enjoyed it as something new, this time round. - Rothfuss' prose is incredible as ever. While I know some dislike the term 'lyrical' for writing, here it genuinely applies: his words have a very poetic, storytelling quality to them unlike any other author I've read - excepting possibly Kay. He's by no means perfect, and these words from the mouth of a few characters sounds alittle incongruous, but it is a pleasure to read. - By contrast, the aftermath of the Felurian sequence seems as silly as ever. [Spoilers, beware!] Okay, perhaps Kvothe learns - well, the art of horizontal romantic liasons - from Felurian, but he has only to step into an inn and people see it in his eyes? And it gets sillier. And as for when he gets back to the University? He's a larger than life character, yes, but the Fela's description of him makes the whole sequence sound more like a wish fulfillment fantasy than a novel - whiich it isn't. - Finally? I yearn for that third novel as much as ever. ...And those were my chief discoveries. I felt the exact same way. With the Fae and Adem parts right next to each other, it seemed like Kvothe was on his back for half of the book. Still, I seriously can not stand waiting for The Doors of Stone. Absolutely. I did like the Adem in part - though the whole 'barbarian' rigmarole can be overdone - but Rothfuss did, I think, overdo it. And same again. The third novel is something I'm massively anticipating - although I'm also anticipating an equally massive delay in release. Mind you, in fairness I am horribly hard to please! I felt the same way on my first readthrough (in particular, the woods section felt interminable). Might be worth giving it another go sometime - when I approached it with lowered expectations on reread, I actually rather enjoyed it. Still, I'm hoping we get more of an overriding narrative impulse for #3. Lovely, isn't it? I actually prefer it to the NOTW cover over here. Though I have noticed that in general, UK covers seem to be slightly quieter (and at least more to my tastes) than most US covers, though I have no clue why.